Wates Construction is a family owned construction business with a deep commitment to the communities in which we work. We have an annual turnover of £1 billion and we deliver across the UK. Our values of integrity, intelligence, performance, teamwork and respect for people and communities are at the heart of what we do. Our partnership with Liverpool John Moores University (LJMU) began over five years ago. Many of our employees, including myself, here in the North West are past students of the University, so there was already an enthusiasm to get involved with the teaching / employability team at the University. 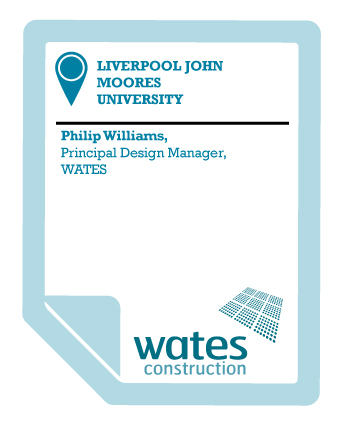 Secondly, Wates have delivered two of LJMU’s flagship buildings, and that had initiated a strong working relationship between both organisations. So it was a natural choice to engage more closely, and to look at how we could support the University with their employability programme. As an employer, we fully recognise the importance of giving young people an opportunity, especially with the tough competition for graduate jobs in the industry. We could see the benefit of the World of Work programme at LJMU and how extensively it prepares students for the industry. So many graduates that apply for jobs with us have no experience, and this puts them at such a disadvantage. The University is effectively ensuring that their students have the best possible chance of securing employment upon graduation and we were delighted to support them with this. We kick-started the partnership by sitting with the World of Work team, listening to them talk about what works for their students, and then proceeded to put together a programme of works. The team at LJMU also gave us excellent advice on funding available, and the various options for placements and so on. We have worked with them to develop mock interviews, placements, seminars, opportunities for students to attend our client functions and site taster days. We also looked at how we can assist in getting students Construction Skills Certification registration, which ensures they could go straight on to site upon graduation. We want to build on this programme of works and we see this partnership as a long-term commitment. It is refreshing to work with a university that truly understands the industry and how the economical turmoil in our country has affected employment for young people. Liverpool John Moores University is engaging very effectively with employers, offering support and guidance, and making it an easy partnership to have. They really are playing a key role in bridging the gap between business and education. We attended their careers fair in October for the Built Environment, and all the top construction employers were in attendance. This really demonstrates that employers are keen to work with the University. The students are attractive to us, as we know they are getting the best employability skills on top of their degree, and this sets them apart from many other students in the country. It is not just the University that benefits from this partnership. We believe it is key to the development of our staff. They are having to get out of their comfort zones, by addressing groups of students, carrying out mock interviews and talking at careers fairs etc. This all plays an important part in their personal development, which benefits us as a business, and also demonstrates it is a two-way partnership between us and the University.